Scarlett Cannon in Blitz magazine, 1985. Photo: Monica Curtin. Image: V&A. 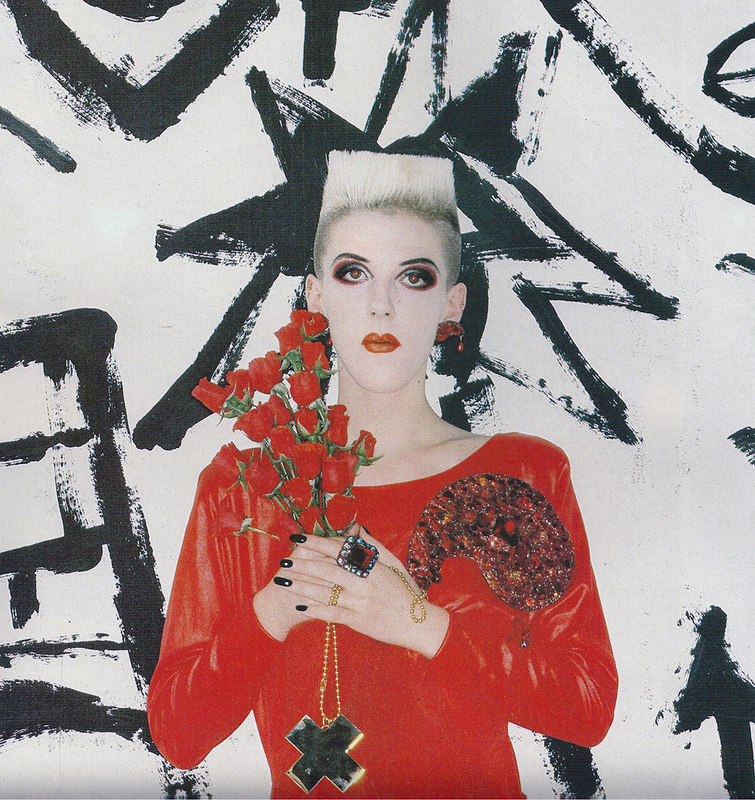 As part of the current V&A exhibition, Club to Catwalk: London Fashion in the 1980s, Juliana Sissons is sharing a pattern for a hobble dress designed in 1984 for London club kid Scarlett Cannon. 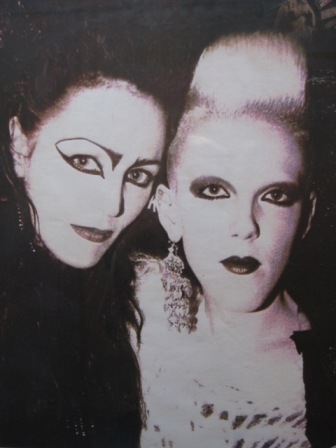 Juliana Sissons and Scarlett Cannon, 1982. Photo: Daniel Faoro. Image: i-D. The Scarlett Dress is a low-backed hobble dress with pleated hip drape and three-quarter sleeves. Inspired by Old Hollywood, the original was made in red stretch ciré jersey and worn to Cannon’s birthday celebrations at the Camden Palace and Bolts in North London. Cannon lent the dress to the exhibition, where it’s styled to fall off the shoulder, accessorized with a Judy Blame bead necklace (Blame’s first piece: photo at Gilded Birds). You can see Cannon’s photos of the exhibition setup on her blog. 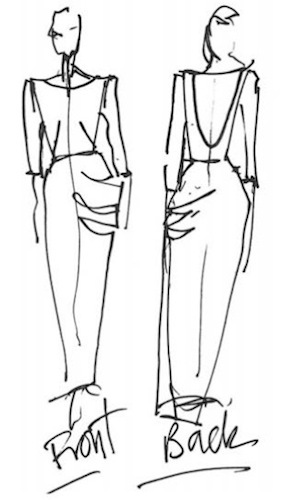 Download the Scarlett Dress pattern. (Pattern here; instructions here.) The pattern has 10 pieces, arranged over 30 pages of A4 sheets. N.B. : It seems the download will be available only for the duration of the Club to Catwalk exhibition, which closes February 16th, 2014. Update: The download is still available as of spring 2014. Click here for the other instalments in my Free Designer Patterns series. Thanks for letting us know about this pattern! Looks quite nice. Is it set to the right size and ready to just go ahead and print….it to comes up on the download as a size of 70 something percent, is that correct?? Normally these must be printed at 100% — and since the seam allowance is 1cm and is marked on the pieces, that could take the place of a test square. I also follow Ruth’s blog and as she was having a problem with the sizing, I wondered about the scaling for the pattern. When I downloaded it, it showed up as 70+ and I thought I would double check before printing off the pattern. 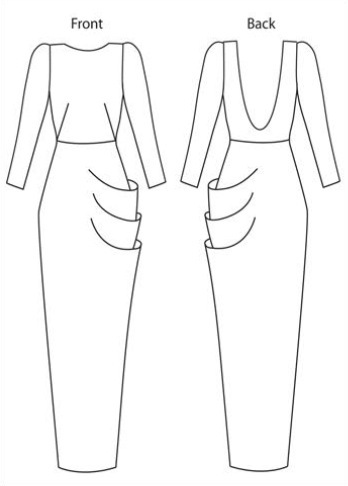 Thanks for letting me know that the seam allowance is on the pattern pieces – that will be a good way of checking that it is printed to the correct scale. I know Ruth will make a fabulous job of the dress and look amazing. Really enjoying your blog. Thanks for sharing with us. I’d love to see pics if anybody makes this dress. Please email photographs to me via my blog and I’ll make a new post in due course. Thanks for stopping by, Scarlett! I hope you’ve now seen Ruth’s version (see comment below).. Looking forward to your post!